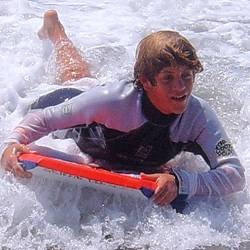 As we've mentioned before, boogie boarding is a favorite pastime among all Aloha Beach Camp kids. There's virtually no learning curve (so everyone can do it) and it's a total blast. This High Action camper's catching a wave at Zuma Beach.